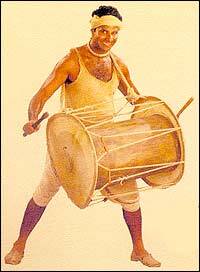 You would remember him as Bagha, the mute in Ashutosh Gowariker's Lagaan. Amin Hajee, we wager you, will soon be a name to reckon with. His next film is this year's biggie: Ketan Mehta's The Rising. 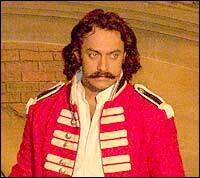 The Rising stars Aamir Khan (playing Mangal Pande, the hero of the First War of Independence in 1857), Rani Mukerji, Amisha Patel and Die Another Day villain Toby Stephens (whose mom is the awesome Dame Maggie Smith), among others. Amin plays Mangal Pande's friend Veer Pratap, who stands by him when the 1857 uprising goes the British way. We were in London when Ketan was going to narrate the story to Aamir. Aamir asked me to act as a bouncing board and tell him whether I liked the screenplay or not. I thought it was a great screenplay and told Aamir that he should do the film. It's a great movie to do after Lagaan. The Rising has what it takes to satisfy the sensibilities of an international audience. The story starts on March 29, 1857, the day Mangal Pande was hanged, and moves back in time, about three years. So it is before and after he was hanged. You can kill a man but you cannot kill his dreams. That is what the film is about -- about this man and his dream of independent India. I had heard of this character Veer Singh whom I play. But I was not meant to do it then. They had a star in mind for this role. It is a very important role. It is a dream role. I play a sepoy in the 34th Native Infantry, with Mangal Pande. As we are in the same regiment, we are friends. I told Ketan I would like to audition for this character. He replied that if they did not audition the star in question, they would take me. Eventually, they decided to audition me. Before the audition, I grew my moustache and beard for two-and-a-half months. I worked very hard to get this role. After the audition, I had to wait for two months before I was given the final okay. I did a lot of research for my character as there aren't too many details about the sepoys who were fighting for the British army. History is a blur in that period and so not much stories and references are available about the people and the sepoys in those times. So we had to read a lot to get an idea. There was a lot of thought involved, about Indians who were serving the British, and fighting their own people. It was very sad because of the situation they were in. They had to earn their bread. The sepoys were constantly in a dilemma. There were delays before the film went on the floors because it was a big project. After the actors were signed on, it took very long for the film to start. The film does not look at only one side of the tale. It also speaks about the British officers. This is my third movie with Aamir. I had done Ghulam before Lagaan. So Aamir is a dear friend. I have known him really well for the last five years, but I was acquainted with him from the days of Qayamat Se Qayamat Tak. We are Bandra (the northwest Mumbai suburb) boys! Our backgrounds are similar. Aamir is very good to work with. He is very hard working, dedicated and patient. He tries to achieve the best, and accepts that from everybody in his team. He leads by example. When you are with him, everybody pulls up their socks and starts working as they see him doing it. He is like my older brother. I have learnt a lot from him. He is very honest and that inspires me. Aamir does and says what he believes in. I am working with Ketan for the first time. He is far more experienced; he has made eight films before this. He has also made television serials. He is a veteran. We shot a Holi song for nine days on different locations. So we celebrated Holi nine times in a month! Then we would go to a well on location and have a bath. On the last day, we had to scrub very hard to remove the colour, as we were to shoot something completely different the next day. But the colour would not come off. So six of us were sent to a five star hotel for a sauna steam bath to get rid of the colour. We had a great time! We were called the Mangal Boys, as we were Mangal Pande's best friends in the movie. There was one scene that really touched me. It's when Mangal explains to British officer William Gordon (Stephens) that is isn't about cartridges, it's about freedom, it's about being able to hold your head as high as the next man. That is one of the best scenes in the film. We shot the film in Pataudi, Tajikistan in Central Asia, Panchgani, Bhor near Satara, Pune, and in around and around Delhi. We also shot in Mumbai's Film City. If it goes according to plan, the movie will release in June. It is a sync sound film, so there isn't much dubbing required. I have seen the film. It is very close to what we set out to say.